Solo Build It! 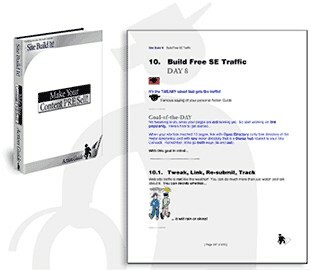 Includes all of the Necessary tools to create a Successful Online Business. The Action Guide is a comprehensive instruction manual that shows You step by step on how to build a niche-keyword-focused content rich site and contains answers to almost every question. the HQs which are resources about different topics such as newsletters. Note: I have been a Solo Build It! owner, for nearly 2 years now and can attest to the exemplary customer service that they provide me with for all four of my successful sites.